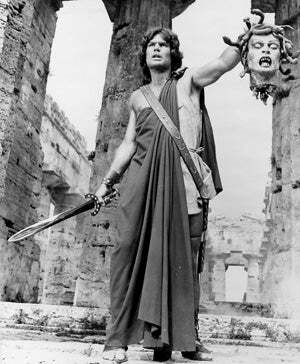 Most would not consider 1981 to be the best year in film, but there were a few notable exceptions, including the almost completely forgotten fantasy/mythology flick Clash Of The Titans. Featuring Laurence Olivier, Maggie Smith and Harry Hamlin, the film reignited the myth of Perseus for a new generation. It remains one of the best film versions of classic mythology, though the production values aren't quite as impressive today as they may have been then. It was a hit, at the time, though most people don't remember it. Why? The film itself clashed with a titan: Raiders Of The Lost Ark, one of the highest grossing films of all time. History has remembered Indiana Jones but forgotten Perseus (the film character, at least). We saw the first glimpse of Leno v. Clarkson last night, and ThreeLitre sees another clash in the works. This is really the ultimate clash of the car culture titans. Clarkson is so bull-headedly anti-american and Jay is just about the most visible American gearhead out there. I think this interview will either be hilarious or incredibly, wretchedly awkward. Petrolhead vs. Gearhead. An epic clash of the titans. This week's show should be a good 'un.